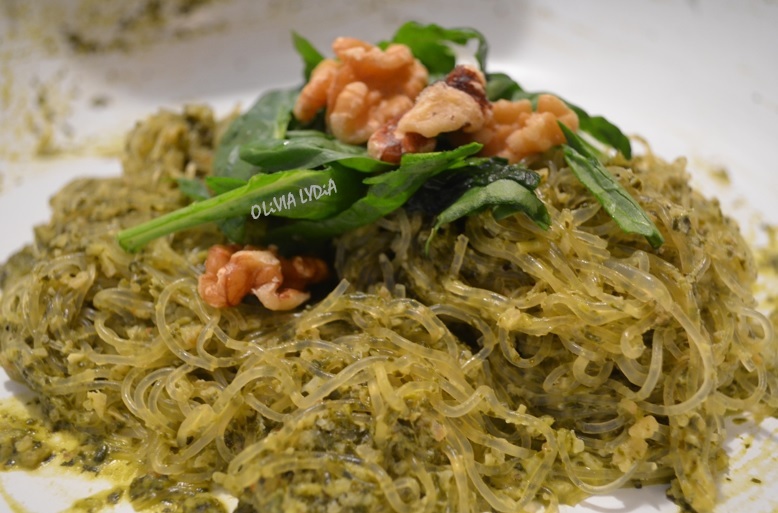 Lemon Pesto Kelp Noodles – Olive For Greens. Pesto is good on its own. It’s so refreshing tasty because of the fresh basil. 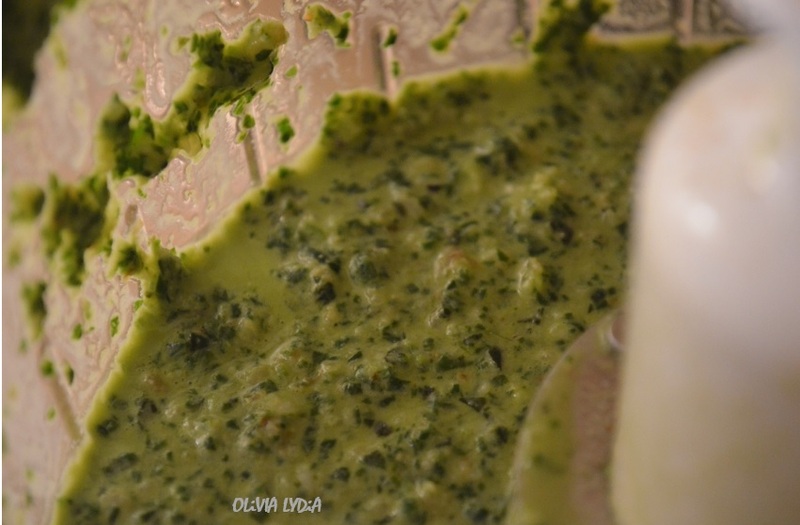 When lemon is added, the pesto flavors are enhanced even more! Kelp noodles are something half as many people don’t know about. The other half chows down on these noodles at least once a week! 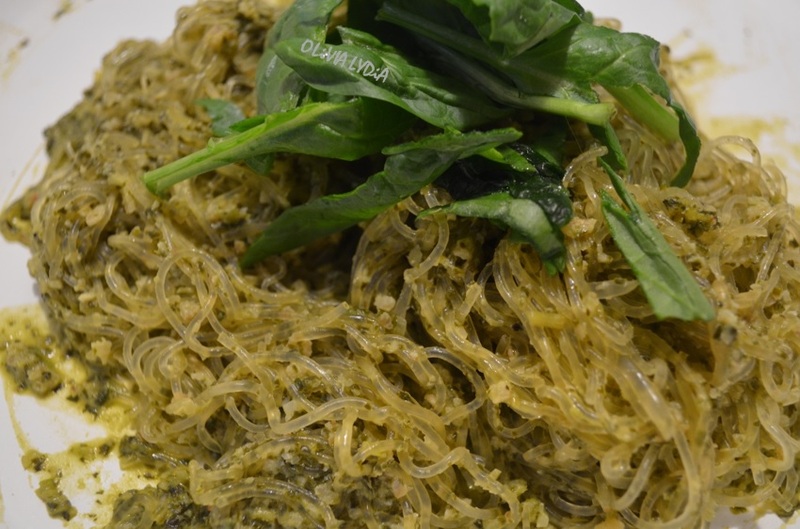 Kelp noodles are a sea vegetable in the form of raw noodle. Made of simple ingredients and are gluten-free, low carb and low in calories. The texture is crunchy when they are raw. When heated or soaked they will not be crunchy or as crunchy. The flavor is neutral. I thought theses noodles were odd when I heard of them but I love them! It’s a must try and inexpensive. Kelp noodles can be found in health food stores or some grocery stores now carry them. There are 2 ways to prepare these- Raw and cooked. Either way will equally as tasty as the other. It depends on your daily diet- whether you are a Raw Foodie or eat raw a few days a week- OR your taste buds- if you are craving warm or cold! NOTE: If you don’t have kelp noodles, free to use any pasta you have (gluten-free preferred for better digestion). Mix the pesto with the kelp noodles. In a large pan, over medium heat, add the coconut oil and the kelp noodles. Once thoroughly incorporated, lower the heat and cover for 5 minutes. Serve warm.